Access to Populi is based on the permissions granted by a person's user roles. Populi's roles reflect the typical range of responsibilities in a higher education context—Students take courses, Staff keep records, Registrars manage enrollment, etc. All users get basic access to Populi, which includes Home, Email, Calendar, Files, and My Profile. Beyond that, a user needs to be given a role in order to use Populi for anything more. It gives the user access to the appropriate functions and information in the system. For example, making a person a Student lets the student do things like enroll in courses, upload assignments, and so on. Making a person a Registrar enables them to create courses, run reports, modify enrollment status, and so on. Populi starts tracking certain information about that person. Let's say the registrar is enrolling students on a course roster. When she searches for a name, Populi finds only people with the Student role—and not, for example, the Student Billing role. What's more, Populi now adds that course information to the students' transcripts. Likewise, the Faculty member assigned to the course can now grade assignments, take attendance, finalize the course, and be evaluated (among many other things). It restricts those users from accessing anything that they aren't supposed to see. User roles also block people from certain activities and information. Academic Admin users, therefore, won’t be enrolled in courses, nor can students access Academic settings. This provides another security layer to protect sensitive information; quite simply, anyone who shouldn’t see certain information, won’t. Roles are not Tags. Tags simply tell you something about a person and help you group them together with other people—they confer no special access to those who've been tagged. Roles, on the other hand, determine what a user can do and what can be recorded about a person. User access is controlled independently of user roles. Read about granting user access, and see below for how to manage user roles. Only users with the Staff role can modify another user’s roles; additionally, no user can change their own role (or another user’s role) to one with higher privileges than their own. So, Staff users cannot create Academic Admins, Admissions users cannot create Registrars, and so on. You can do three things with user roles: add them, remove them, and inactivate them. Under the profile picture, click edit roles. Select the role from the drop-down and click Add. The list of user roles you can add to a person depends on what's permitted by your own user roles. Repeat steps 3 as often as you need to. When you're all done, click Save. After giving someone a role, you can later remove that role or change its status to Inactive. Removing a role takes away the person's permissions in Populi. It can also hide information you've collected about that person—for example, removing the Student role will obscure their transcript and other academic records. Deactivating a role "pauses" those permissions for that person; it will not hide any of the role-specific data you have for that person. If you wish to remove a role, click . If you wish to deactivate a role, uncheck the box next to it. Removing or deactivating the Student role will prompt you for an Exit Reason. Read more about student exits. Repeat step 3/4 as often as you need to. When you're all done, click Save. Here's the list of what each role can see and do in Populi. If you give a user more than one of these roles, they will have the access and abilities of all of those roles. Important! If certain things are not mentioned in a role description, then the role in question gives a user no access to the thing not mentioned. For example, Admissions says nothing about Billing or Financial Aid—that's because the role gives you no access whatsoever to that information. Every Populi user gets basic access (even those without specific roles): Home, My Profile, Email*, Calendar, and Files. They can edit their own contact information, and view others' Public contact information. *Email is optional for all users if you've integrated Populi with Google Apps for Education. They have full read/write access to everything in College Management. They can’t enroll in or teach courses; they can, however, view and edit all course information (including assignments, grades, enrollment info, etc.). They have full read/write access to all information on Profiles except for Financial (also, see Discipline). They can give any person the following roles: Academic Auditor, Admissions, Admissions Admin, Advisor, Campus Life, Discipline, Faculty, Registrar, Staff, Student, and Teaching Assistant. The Registrar role gives a user access to almost all academic information at your school. Registrars are automatically given the Staff role. They have full read/write access to everything in College Management except for Settings. They can give others the Admissions, Advisor, Campus Life, Faculty, Staff, Student, and Teaching Assistant roles. Academic Auditors have read-only access to all academic and academic-related information at your school. DO NOT give this role to regular students who wish to audit courses! The Student role lets people enroll in and audit courses. They have read-only access to these sections of College Management: Home, My Profile, Files, Academics, Advising. Within Academics, they can see everything except Settings. They can view all course details. They have full read-only access to all information on Profiles except for Financial. They cannot give any person any user role. In Account > Security, you can control whether Academic Auditors can view course evaluations. Advisors have complete read-only access to the academic information for the students they are advising. They can register the student for courses on the Profile > Registration screen during online enrollment periods. The Discipline role, when paired with another role with access to the Profile > Student view, gives the user read/write access to student disciplinary records. If not paired with a role that can access Profile > Student, the Discipline role only permits a user to see items on a person's Activity Feed marked as visible to the Discipline role. This limitation includes the Faculty role. Academic Admins can add and view disciplinary records for any student. Advisors can see whether their advised students have disciplinary records, but cannot read them. Paired with the Discipline role, they can then read those records. Faculty and Teaching Assistants have comprehensive access to the courses in which they are so listed. They cannot change basic course information (e.g. abbreviation, meeting times, etc.). If the Enrollment setting (on Course > Info) is set to allow faculty to manage enrollment, then course Faculty can manage all enrollment functions for that course—including enrolling students, changing student status, and changing course names on the Roster. They can see public contact information. The Student role lets a person enroll in or audit courses. It also prompts Populi to begin recording an academic history for that person. For all courses, they have read-only access to Dashboard, Info, Assignments, and Calendar. If enrolled in a course, they can interact with assignments, lessons, discussions, and tests. They can also create new discussions. If enabled on Course > Info, Auditing students can have similar access. On their own profiles, they can see the Bulletin Board, Info, Student, and Financial tabs. On Student, they can read their transcript, degree audit, and any information entered in the right column (Courses, Degrees, etc.). They can export an unofficial transcript, schedule, and grade report. On Financial, they can read all of their financial and financial aid information, make payments, download statements and 1098-Ts, work on financial aid applications, and accept/decline financial aid awards. On other people's Profiles, they can see all public contact information for college staff, faculty, and other students. The Admissions Admin role gives a user access to all admissions information at your school. Additionally, they have access to all Admissions settings (creating applications, lead routing, etc.). Admissions Admin users are automatically given the Staff role. They have full read/write access to College Management except for Academics, Advising, and Campus Life. They can’t enroll in or teach courses. They have full read/write access to all information on Profiles in the Activity Feed, Info, and Admissions tabs. They can see a faculty user's Faculty tab. They can give others the Admissions, Admissions Admin, and Staff roles. They can also add the Student role to leads when they set an application's status to accepted. They can also add new people as Leads. The Admissions role gives a user access to all admissions information at your school, except for Admissions > Settings. Admissions users are automatically given the Staff role. They can give others the Admissions and Staff roles. They can also add the Student role to leads when they set an application's status to accepted. They can also add new people as Leads. They have read/write access to all information and settings in Billing, Accounting, Donations, Campus Life, and Bookstore. They have read-only access to Financial Aid; they also have the ability to complete a disbursement batch. They can give others the Financial Admin, Student Billing, Bookstore Admin, Bookstore, Campus Life, Donations, and Staff roles. They have read/write access to all information and settings in Financial Aid. That is, except for disbursement batches. They can process disbursement batches up until the final step. They have read-only access to the information in Billing and Accounting. They have read/write access to all financial aid information for anyone in Populi. They can give others the Financial Aid and Staff roles. The Student Billing role gives a user access to all billing information at your school. Student Billing users are automatically given the Staff role. They have read/write access to all information in Financial > Billing, except for Settings. They can give others the Staff role. The Donations role gives a user access to all Donations information at your school, with the exception of Donation Settings. Donations users are automatically given the Staff role. The Staff role gives a user access to basic information for people and organizations. They have read/write access to these sections of College Management: Home, My Profile, Files, Admin, and Communications. They can manage the News feed via Home > Manage News. On Profiles, they have read/write access to the Activity Feed, Bulletin Board, and Info tabs. They can also add and edit tags. They cannot see any academic information on the Student tab, nor can they see financial information on the Campus Life or Financial tabs. They can give other users the Staff role. Campus Life gives a user access to all the functions in Campus Life, except for Settings. 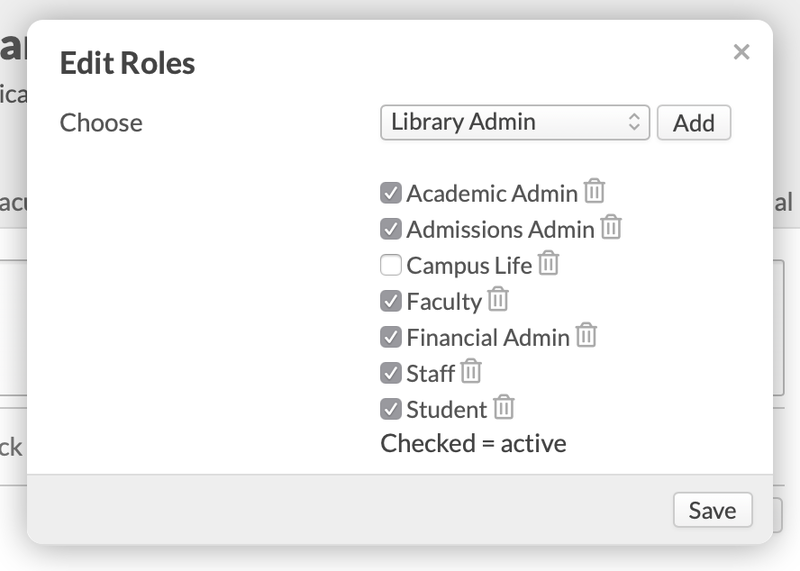 Campus Life users automatically get the Staff role. They have read/write access to these sections of College Management: Home, My Profile, Files, Admin, Campus Life, and Communications. On Profiles, they have read/write access to the Activity Feed, Bulletin Board, Info, and Campus Life tabs. They can also add and edit Tags. They cannot see any academic information on the Student tab. They can add Campus Life fees and room/meal plans to student accounts; they otherwise have no access to financial information. 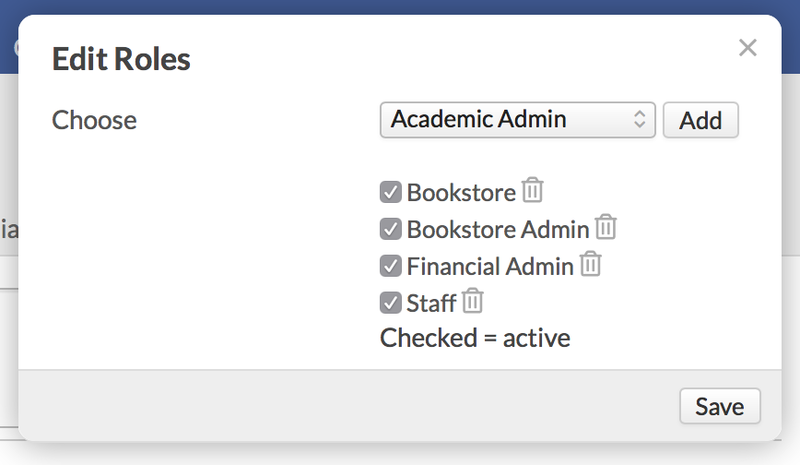 Bookstore Admin gives a user read/write access to all components of Bookstore—everything from processing Bookstore orders (Point of Sale and online), viewing reports, adding/updating items and inventory, and editing/updating all Bookstore settings. Because their workflows might involve accessing or updating a customer's contact info, they are automatically given the Staff role. Bookstore gives a user the ability to run day-to-day operations in Populi Bookstore—processing Bookstore orders (Point of Sale and online) and viewing Bookstore reports. They do not have access to Bookstore Settings. The Library Admin role gives a user complete access to all Library information and settings. Library Admin users are automatically given the Staff and Library Staff roles. They have read/write access to all Library Settings. They have complete read/write access to all resource- and library-related information. In addition to Staff-level access to regular profiles, they have complete access to Patron profiles. The Library Staff role gives a user the ability to run day-to-day operations in Populi Library. They have complete read/write access to all Patron-related information. They cannot add Resources or manage Library Settings. Library Staff has complete access to Patron profiles. Library Patrons can go to Populi Library and search for resources, place holds, and leave reviews and recommendations. This article fully describes their access to Library. If a user already has either the Student, Faculty, or Staff role, then he already has access to Library. Only give this role to people outside of your school who otherwise do not have access to Library. It would be great if you could create a matrix that showed the roles down one side and the various rights/responsibilities across the top with a dot or check mark in all the resultant boxes that indicates what rights/responsibilities each role has. This might be a great assistance in visually understanding what the narrative paragraphs further explain. I do want to make this article a bit more clear and readable. But since the text editor in this software is a real drag when it comes to creating tables or a matrix like what you describe, this'll probably remain as text. Can you insert Images or attach files? If you could diagram and attach that would work as well. When I give a user the "Discipline" role, it does not give them access to the Student tab, which they need in order to be able to see current disciplinary actions or add new ones. Am I missing something? Yes, I added the role to someone with the staff role. Hi, what role would be best to assign to the admissions department for them to be able to take snapshots (pictures) of students without being able to alter any other information in the student's profile. Thanks!!!! Sorry for taking so long on this response--I've been out of town. Admissions users automatically have the Staff role, so they should be able to add or change Student pictures. I noticed that in the activity feed we can indicate "Library Admin" or "Library Staff" for visibility. Is that a role that is available to grant? What privileges are afforded such roles? Who may grant such roles? We have a Library system that we're currently beta-testing. It's not available to all of our customer pending further development and refinement based on feedback we receive from our testers. Part of releasing that beta version to our testers involved releasing the user roles out into the wild, as it were. For now, they won't do you any good, but as the release of Library draws nearer (no specific timetable yet), we'll be in touch with our customers to get them ready. I would like my admissions people to have the ability to see registration information in coaching people through the initial registration to the college. Is there anyway to give them just read only status on the registration tab? Give your Admissions folk the Advisor role. Assign them as advisors to particular incoming students. After they're done coaching the incoming frosh through the registration process, remove them as Advisors from those students (but leave the role on their profiles). I just updated and cleaned up the User Role article. I hope it's more helpful now! EDIT: And note the addition of Academic Auditor so now you can give read only access to Academics. I have students from different cities/countries. Is there a role in Populi that allows an Administrator of the branch in that city/country to look only (like and auditor) at their records, and not having access to the other records in the system? I've taken a stab at creating a crude matrix this afternoon, based on the documentation on the "User roles" article above. I'm also copying this exact post to the Roles Descriptions feature request entry (https://support.populiweb.com/hc/en-us/community/posts/214224587-Roles-Descriptions?page=1#community_comment_360004561073). It's not yet complete, but it's a start. I've used Excel's comments feature to note exceptions and create lists of individuals to be assigned to each role. In that regard, the comments are specific to our institution, but the visible content of the matrix should be universally standard. Take a look at this screenshot and let me know what everyone thinks. If it's useful, I can convert it to a shared document where we can all add information and insights. Our institution is just getting started with Populi, so it would also be very helpful to us to have experienced users point out errors in this matrix and help fill in the blanks.